The lake water is at it’s highest point in recent years thanks to the snow pack this past winter. This is your invitation to explore all the park has to offer. 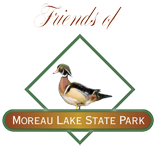 Moreau Lake State Park is located in the Palmerton Mountain Range, between Saratoga Springs and the Glens Falls area, in both Saratoga and Warren counties. Discover the park’s beautiful scenic views and challenging terrain on both the shores of the Hudson River.